Why purchase our Premium Multipurpose Blog WordPress Theme? The Multipurpose Blog WordPress Theme is designed specifically for bloggers. This Multipurpose Blog WordPress Theme to make blogs about photography, food, fashion, lifestyle, magazines, travel, sports, technology, personal blog, craft blog, creative blog, video blogs, tech review blogs, Food review blogs, gaming blog, sports blog, e-sport blog, business blog, Media blogs, entertainment blog, Podcasts, animals, pets, Wiki websites and as well as modern newspaper websites. It is one of the most popular blog WordPress theme that come with plenty of features & user-friendly customization options. It includes features such as quick page speed, responsive design, mobile-friendly, user-friendly, SEO & cross-browser compatibility translation ready and etc. Running and maintaining the blog can be a difficult task. Your knowledge, creativity and presentation method can decide how well the blog will perform. 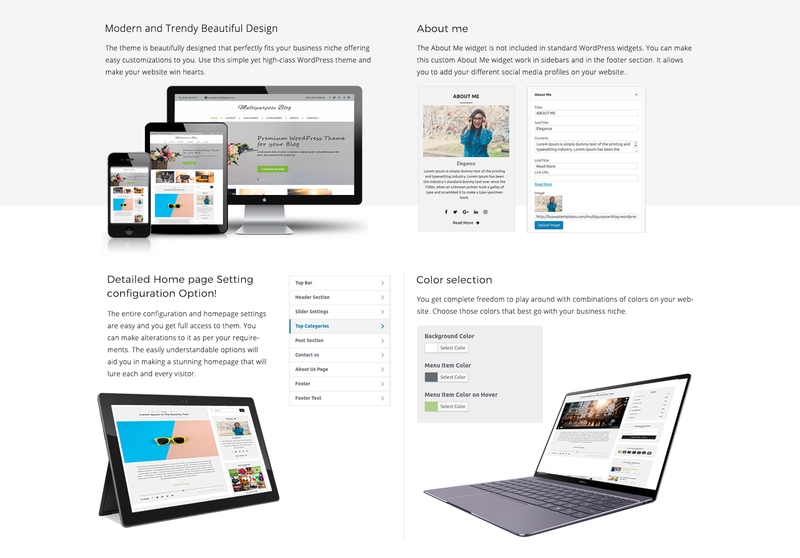 Since you are only going to be concerned with writing and posting quality content, you would want to have the best premium WP Blog theme that works swiftly. A glitchy and faulty theme is only going to force your attention elsewhere, this would never happen with our themes. Our premium blog WordPress theme is the best on the web, we have worked hard in weeding out issues and fixing the theme thereby giving you the best product possible. Not only that, our theme has a large slider with a banner that has a Call to Action Button (CTA) to attract the visitors. It is compatible with WooCommerce and contains features & beautiful layouts for products, posts, and pages. It is made with secure and clean codes with hooks, shortcodes and other add-on customization options that allow you to customize your website without having to write even a single strand of code. This top blog theme has been made on Bootstrap 4 framework which simplifies the development process. This premium blog WP theme checks all the boxes regarding features and functionalities. You can take tour of premium by just clicking on demo button, well To sum it all up, we would like to call it the most suitable bloggers theme . This one theme is for each and every blogger out there that wishes to create the best of the best content and have an amazing theme to present it to the world. Full/Narrow Content Width option for Single Pages. Full-Width Image for Single Post/Page Content.